When was the last time you wanted to measure something, and the tool you needed was already within arm’s reach? I can’t think of a single time that’s happened to me. I don’t work in construction, so I don’t carry measuring tape or any similar tools around with me. But you know what I do always have with me? My iPhone. With AR MeasureKit, developer Rinat Khanov has created a toolkit that can be carried around with no extra baggage – all you need is your phone. 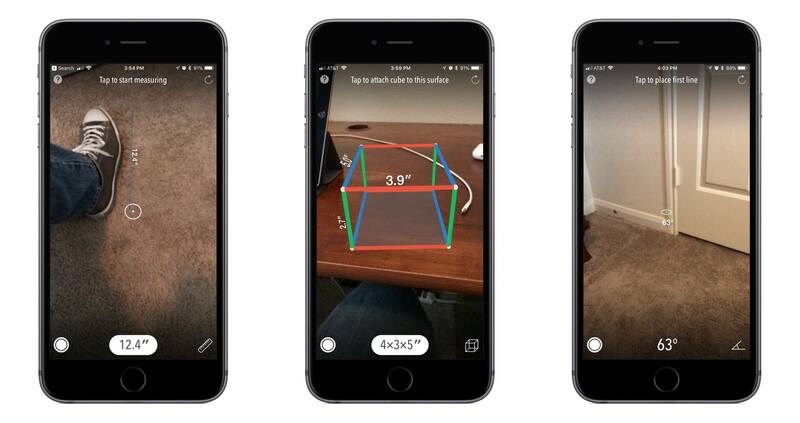 In late June when developer ARKit demos began showing up online, one of the first prominent videos featured digital measuring tape. Many people were amazed at ARKit’s ability to measure distance with such accuracy, while others simply wrote the idea off as a silly use of AR. 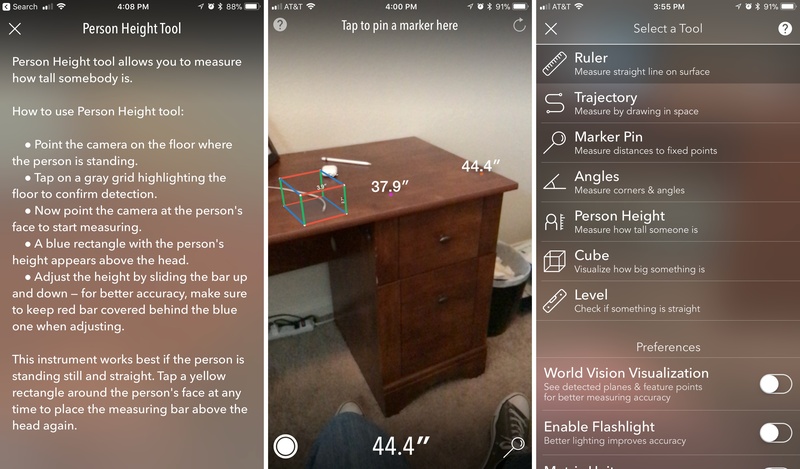 While I think a simple AR ruler as seen in that first demo would have still been useful, MeasureKit offers much more than that. The app contains a comprehensive set of tools that makes your iPhone or iPad into a sort of Swiss Army Knife of measuring. MeasureKit includes seven separate tools that take advantage of AR to serve different purposes. Ruler: As you would expect, the ruler tool enables measuring distances like you would with a standard tape measure. It works on horizontal and vertical surfaces, requiring you to tap the screen at start and end points, and displaying a real-time measurement as you move the on-screen target across the intended space. Once a measurement is complete, it remains onscreen, and you can perform measurements of other items within the same measuring session. Trajectory: With the trajectory tool, you measure by drawing with your device in open space. In my testing it wasn’t as accurate as the basic ruler tool, but it works best for long distances or curved objects. Marker Pin: The marker pin is by far the easiest tool to use: simply tap once on the surface you want to measure your distance from, and a pin will be dropped there. After the pin is dropped, you can move away and see how far you are from that pin at various distances. Angles: This tool exists to find the degree of an angle, such as a corner. Using it requires tapping on one side of the corner, then its center point, and last the other side of the corner. Person Height: This measures a person’s height by first seeing where they’re standing, then measuring the distance to the top of their head using face detection. It’s a neat use of iOS 11’s technologies, putting both ARKit and new face recognition APIs to work. Cube: The cube is a fun way to understand how big or small something is, and can be used for things like determining whether something will fit in a certain size package. It projects a wire frame cube into the world which can have its dimensions manually adjusted to just the right size. Level: The level is an aid for checking whether a surface is perfectly horizontal or vertical – just tap on the surface where you want the level to appear, and see how it looks. If you get close enough to a detected surface, the level will automatically attach to the surface and you can tap to confirm that’s where you want it. It takes some time to get used to the idea that a measurement depends not only on the tool you’re using, but on your steadiness of hand and precise following of instructions. Khanov clearly knew this would be a challenge, so he’s built-in a certain amount of hand-holding that helps prevent a potentially frustrating experience. Every tool comes with its own set of step-by-step instructions that can be accessed by tapping the question mark in the upper left corner. I recommend reading each one before attempting to use a tool. Once you’re ready to actually start measuring, the app also includes helpful onscreen directions reminiscent of the instruction baked into the Camera app’s Portrait Mode. Another feature that may prove helpful in increasing measurement accuracy is World Vision Visualization. Flipping this switch on allows you to see all of the iPhone’s detected planes and feature points, so you can perform measurements in line with ARKit’s understanding of the world. This is especially helpful when performing multiple types of measurements in a single session. With its versatility of tools, MeasureKit effectively demonstrates the flexibility and power of ARKit. It takes a tool we always have with us – the iPhone – and expands its feature set in unexpected ways, creating something we didn’t know we wanted, but that’s hard to give up once you have it. If you’re looking for an ARKit app that’s more than just a neat demo, but instead provides true utility in your life, MeasureKit is it. MeasureKit is available on the App Store.